MALACCA: The state is now home to the largest international go-kart circuit in the country following the officially opening of the Malacca International Motor­sports Circuit (MIMC) in Durian Tunggal recently. Tipped to be the largest of its kind in South East Asia, the RM9.9mil MIMC circuit is located on a 35ha site, with 1.7km long and 10m wide racetracks. Chief minister Datuk Seri Mohd Ali Rustam said MIMC also has two-tier grand stands with 800 seats, office, ticketing booths, operation room, service and inspection area, clinic and pit-stops for each racing team. 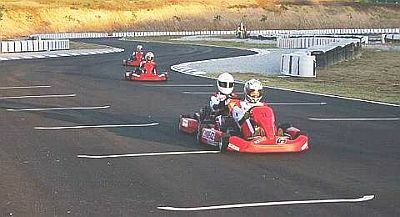 Time to race: Go kart racers enjoying the length of the new Malacca International Motorsports Circuit (MIMC) in Durian Tunggal. The circuit comes with state of the art technologies and facilities and was built not only for go-kart racing but also other motorsports like motorcycle and car races, he told reporters after signing a plaque to officiate the opening of the circuit recently. He said the circuit would become an added attraction for the state as it would provide both local and foreign motorsport lovers an alternative circuit to race at other than the circuits at Shah Alam, Sepang and Cyberjaya. “I hope speed lovers and teenagers will come here to enjoy themselves instead of involving in unhealthy activities or riding dangerously on the road,” said Mohd Ali. He added that the state government has offered to sell the circuit to the Ministry of Youth and Sports and hoped for a positive outcome. Mohd Ali and state council mem­bers gave two thumbs up for the track after taking a spin themselves during the opening ceremony.